I had the opportunity to take a few days off during the holidays and my top priority was to do some sewing! 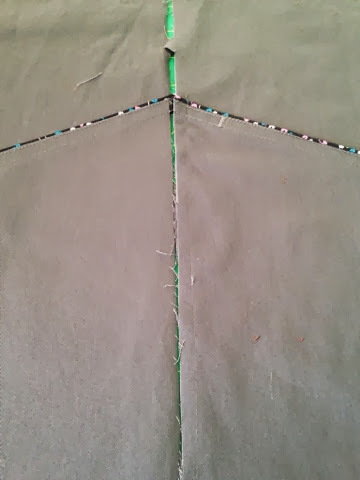 It felt great to get in front of my sewing machine again! I had just been serviced a week before and it sewed like a breeze. One of the patterns I wanted to try was Sewaholic's Minoru Jacket. I had Fabric Mart's Charcoal Organic Cotton Twill in mind for this jacket along with a cotton print from Marc Jacobs (no longer available) and the teal pongee lining. This was my first Sewaholic pattern but was excited to give it a try. I was drawn to it because of the RTW look of this jacket. 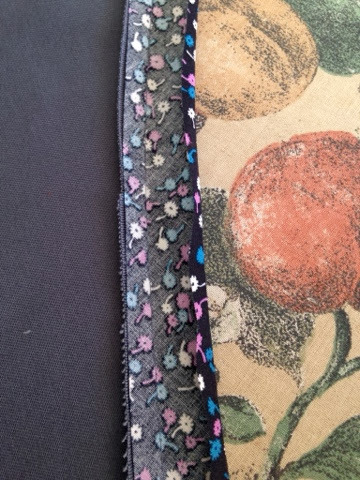 Many of the seams are top-stitched (which I love!) and elastic is inserted in the back of the jacket cinching the waist. The directions were clear and pictures easy to understand as well. The basic jacket is constructed in the first few steps, so once you have the fit, you can focus on the details that this jacket has. I really like having pockets in my jackets. I carry a purse, but I like to have my phone at my fingertips, not stuck at the bottom of my purse! I browsed around to web to see what other people were doing. I saw a front pocket adaption on pinterest, but they did not blog about it. So I thought I would! 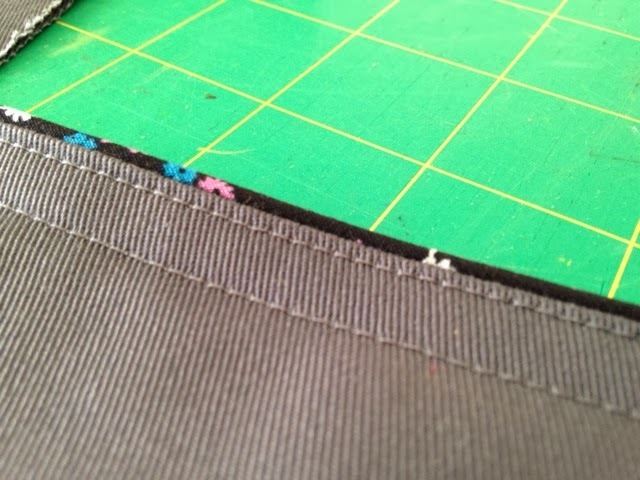 Before I started sewing, I had to construct the pockets. I tested the pocket out on my muslin to get a good idea of placement. I researched similar pockets found in RTW and drew the placement on the muslin. (See the yellow line?) The slope begins center front, just below the waist and ends at the hip. 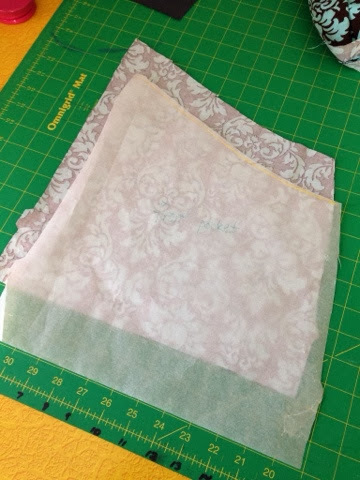 I took some pattern paper and traced the pocket pattern directly from the muslin. Of course I tested the pocket on the muslin first, but once I had it right, I cut two pieces out of the twill, making sure you have pockets going in different directions. Since I am lining the hood (I will explain later), I wanted to accent the front of the jacket with the pretty lining too. 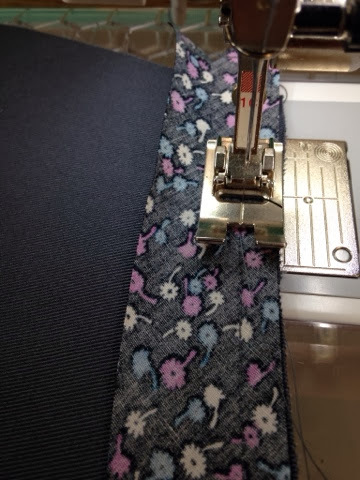 I cut 1 1/4" bias strips to go along the top of the pocket. 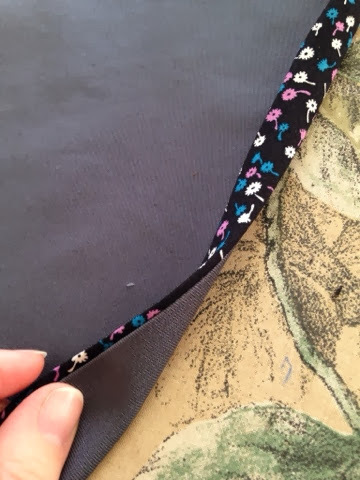 Using a 3/8" seam allowance, I sewed the bias strip to the top of the pocket, right sides together. Then I pressed the seam allowance toward the bias strip, followed by pressing down 3/8" along the raw edge of the bias strip. 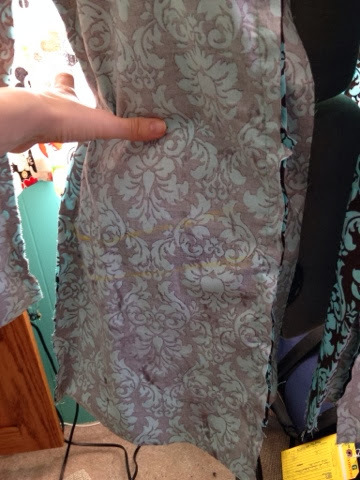 I wanted to make the bias strip look like piping, so from the back of the pocket, I folded the bias strip almost in half, allowing about 3/16" peak through to the front of the jacket. Then I top-stitched the bias strip, adding yet just another RTW touch. 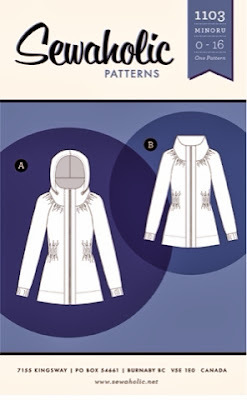 Baste the pocket to the jacket front and finish the jacket like normal. 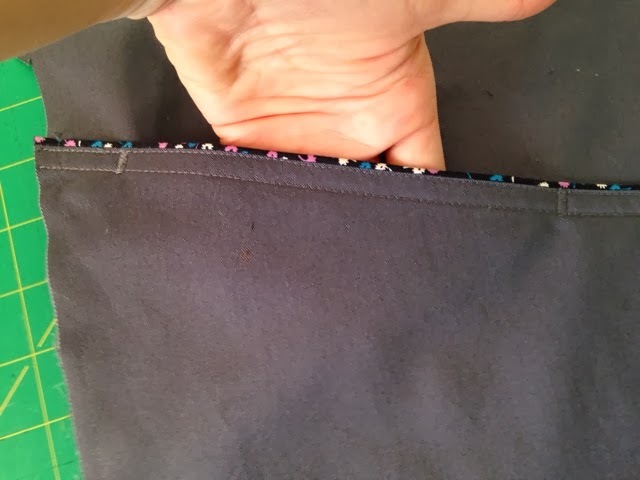 I added some stitching to the sides of the pockets to reinforce them. I used a compacted zig-zag stitch. Now lay out the pockets on your front jacket pieces. 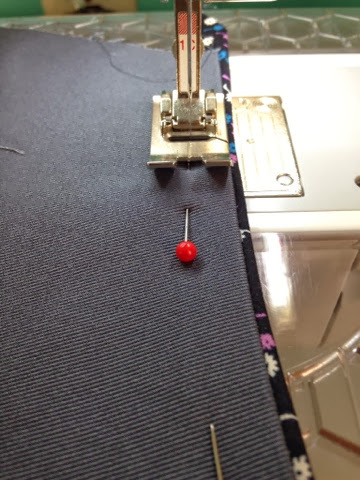 You want to make sure the piping meets at the same place along the zipper front. Sew the rest of the jacket per directions. When hemming the jacket, you will notice some extra bulk because of the extra layer you created with the pocket. I cut off the bottom of the front piece to minimize the bulk. The hem is top-stitched on this jacket, therefore the top-stitching creates a bottom to your pocket. Stay tuned for a tutorial on a lined hood and finished garment pictures! I'm interested to see the finished garment. It looks to me like you're doing pockets all across the front, from the side seam all the way to the zipper, and slanted up toward the center? What an utterly cool design! It is being done on the front of the jacket. I will be posting a finished picture in a few days! I can't wait to see the finished project. How inspirational! Made by a Fabricista: Minoru Jacket Finished!